I've chucked somewhat of a lite version over in the main thread. Looking at the players out and the structure of their bench he should get 60mins + and make some decent coin. So a couple notes: have opted to trade Arrow to give help give me an upgrade fund over the next few weeks and allow him to get back up to speed. 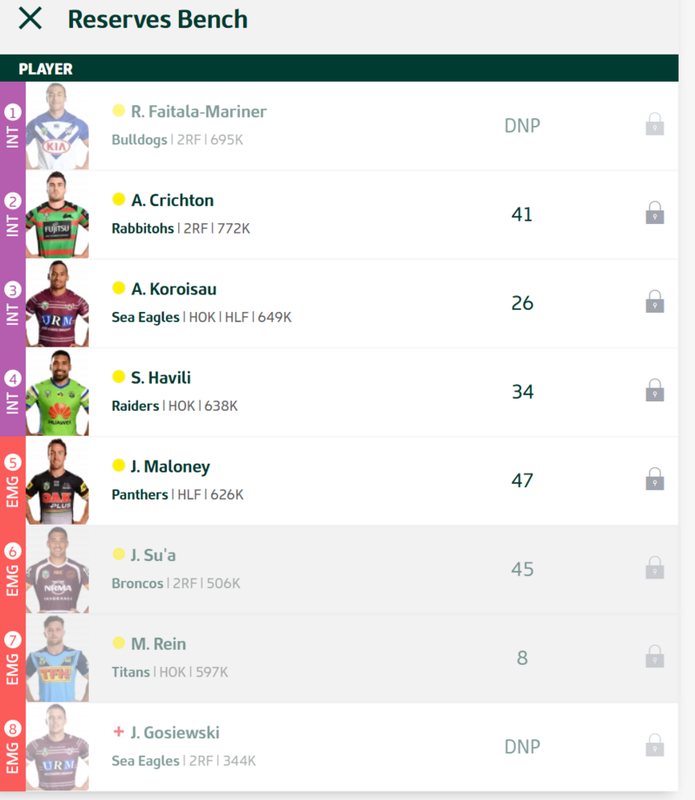 Secondly I have seen it mentioned that Fifita has a niggle with his knee, so as an insurance policy I have structured my bench and trades that Sorensen will be the trade out. With Gallen out I definitely want Fifita but don't want to trade him in this week if he doesn't come onto the field. Should something happen and he not make it on the field I can reverse the trade as they both are in the same team. Have reverted back to my original trade plans and will keep some bank to help for upgrades to cows maxing out. 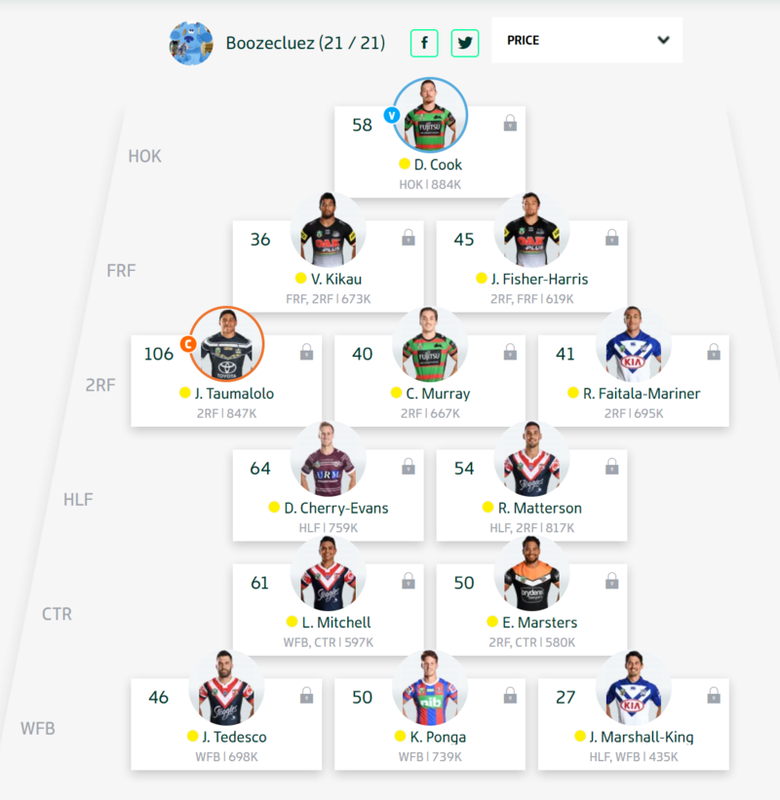 Will give Maloney one last hurrah against the knights this week as well, will be sad to see him go but my blood pressure will thank me next week. Grand Angus is back in good form and finally not running the decoy. I like it mate, for who? Down to the business end of things and just before Origin 1 the plan is to make 8 trades. 2 this week, 4 next and 2 the following. 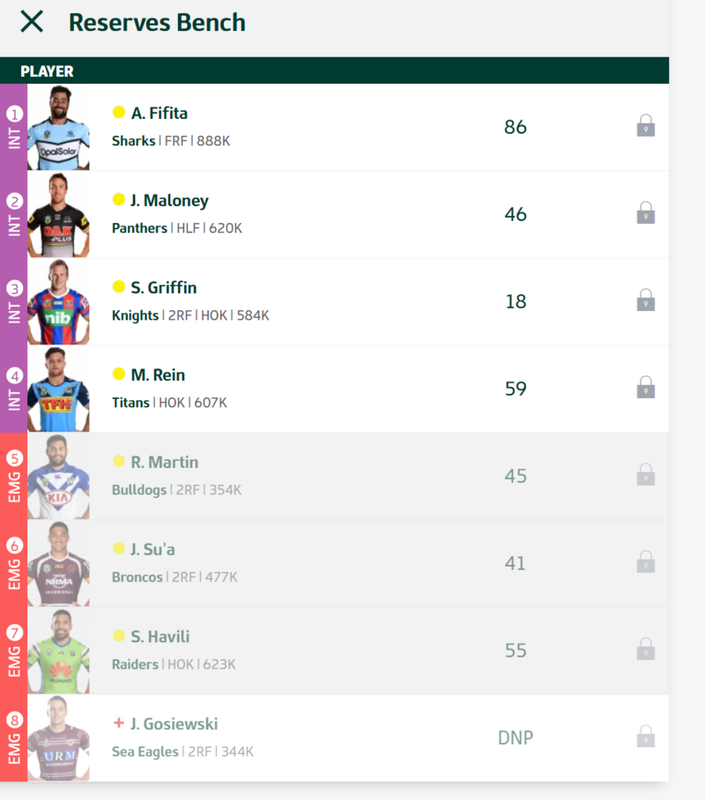 This will lead me with 6 trades just for injury to ride the season out but will mean I will be 'full strength by the start of round 14. If anyone sees anything I may have overlooked, any alarm bell type decisions or possible trade options then please let me know. I need 8 to go to free up space for players coming in. Of these Gosiewski isn't urgent, JFH has useful DPP and Murray is a gun if he get's a start. The next lot are making money still or are dead money but may have to go to allow upgrades elsewhere (Also don't play rd 13). Jaydn Su'a, Jeremy Marshall King, Raymond Faitala Mariner, Jack Gosiewski, James Fisher Harris. Of these RFM has potential to be a cut price keeper but his injury and byes don't help now. Last there is Rhyse Martin who is scoring well enough to play in my 17 and is still making big money. So the 8 trade outs have picked themselves, with Martin being the survivor based on future potential. At this stage the timing of the trade outs is that they don't play the bye and the fact they have mostly peaked works out ok = bonus points now. Saying that if there are value buys who don't play 13. I will still bring in even now as this is the final team. Saying that if there are value buys I will still bring in even if they don't play the 13 bye round and cash outs will be done in rd 13 to give me a few bonus points. Best way is to look at this is there are some must have players who are cheap or can go large and the balance will work itself out. *I still need to allow for cover in the FRF/2RF position in case of short term injury. Worst case I could keep JFH and keep him as 18th man, meaning Martin is in my 17 until a time he can be upgraded late. 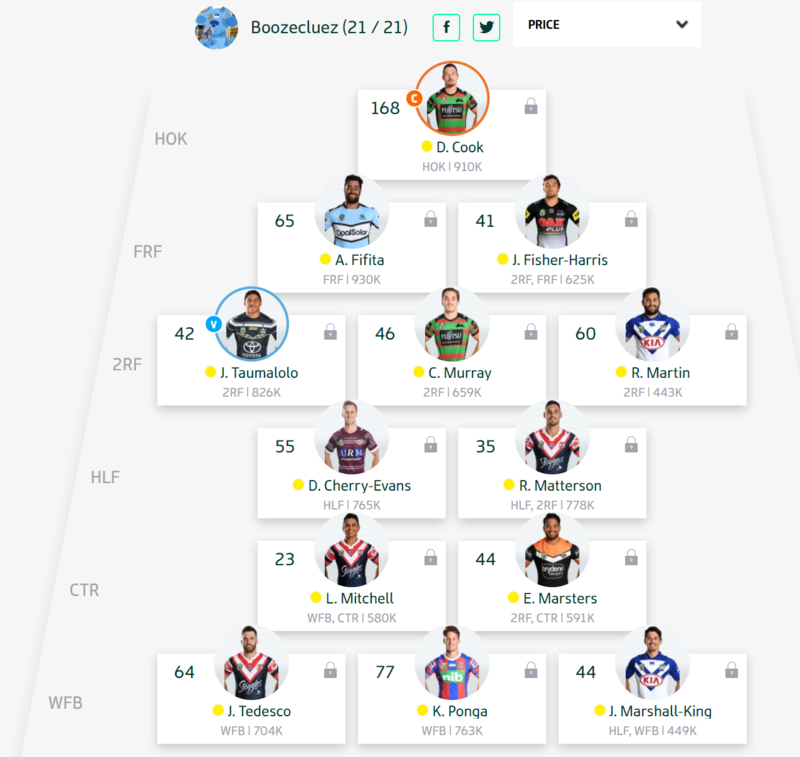 (Brimson/Holland/Fonua) Of these Fonua plays 13 but is in and out of team, Holland could be relegated to bench so Brimson is the pick probably here but would have to be this week. Given the lack of any real cows with long term potential to hang around then probably Brimson is the go here. I have thought about Harris but I don't want to get stuck in round 14 with too many trade in's so may have to go early on a couple. Alot of detail in here Boozy, good work. @Revraiser wrote: Alot of detail in here Boozy, good work. Taupau - will splurge and pay top dollar for the DPP, no origin and more game time.